Do you have students on your caseload that have trouble determining how big or small their problems are? They might get very upset when they are told no or lose in a game? Or constantly over-react to small issues? I do! So I created this packet that will help your students better understand their problems and how to solve them ! It will teach them how to figure out the level of their problem on a scale of 1-5, name examples of each, know how to react, and figure out how to solve each problem they face! 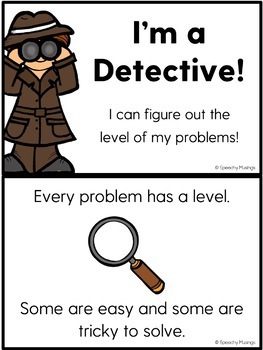 I love using the vocabulary "level" and relating solving problems to playing video games. Some levels might be trickier to complete than others, just like solving problems in real life! This packet will get them thinking about questions such as, "Do I need an adult to solve this? ", "Will this problem last a long time? ", "Does this problem have an easy, obvious solution? ", and "How many people does this problem affect?". 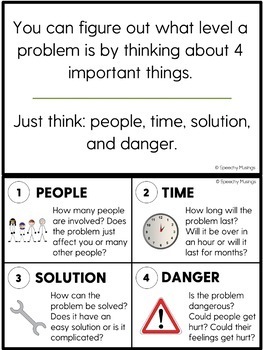 It describes problems by 4 characteristics: people, time, solution, and danger. Purchase the packet to learn more! •Play War! Divide the deck evenly between all players. Have each player flip over the top card. Whoever has the biggest (or smallest) problem wins all of the flipped over cards. Whoever has the most cards at the end of the game wins! •Play memory. Put all the cards face down. Take turns flipping over two cards to try and find two problems that are the same size. Keep the cards when you find a size match! 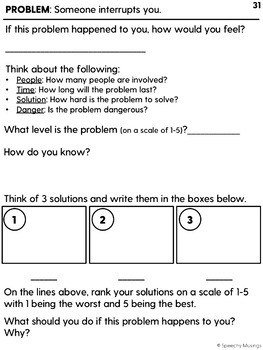 I intended for this packet to be used with students that are cognitively able and ready to use a 5 point problem scale. Sometimes, with younger kiddos I keep it simple and focus on big (tricky) vs little (simple/easy). If you want to do this with your younger students too, that is definitely possible with this packet. Just get rid of the level of the problem number pages in the booklet and have them sort the cards into big/tricky vs little/easy categories instead of the 5 point visuals included. One of the included worksheets provides a mathematical way to calculate the size of a problem which is helpful for your "concrete" students! It also helps with disagreements between students or you and your students. ☺One buyer said, "LOVE this product. I use it so much with great success. My principal asked me to present it to the faculty. Many were interested and I was able to refer them to your TpT store to get it!!" 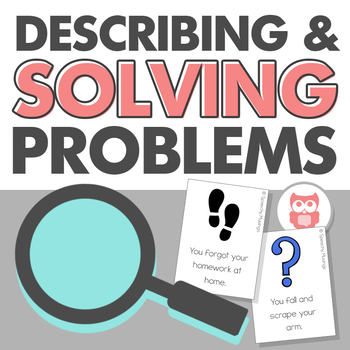 To see more pictures, example pages and ideas for targeting describing and solving problems, check out my blog post about this item here. If you have ANY questions or concerns, please email me at speechymusings@gmail.com before purchasing!